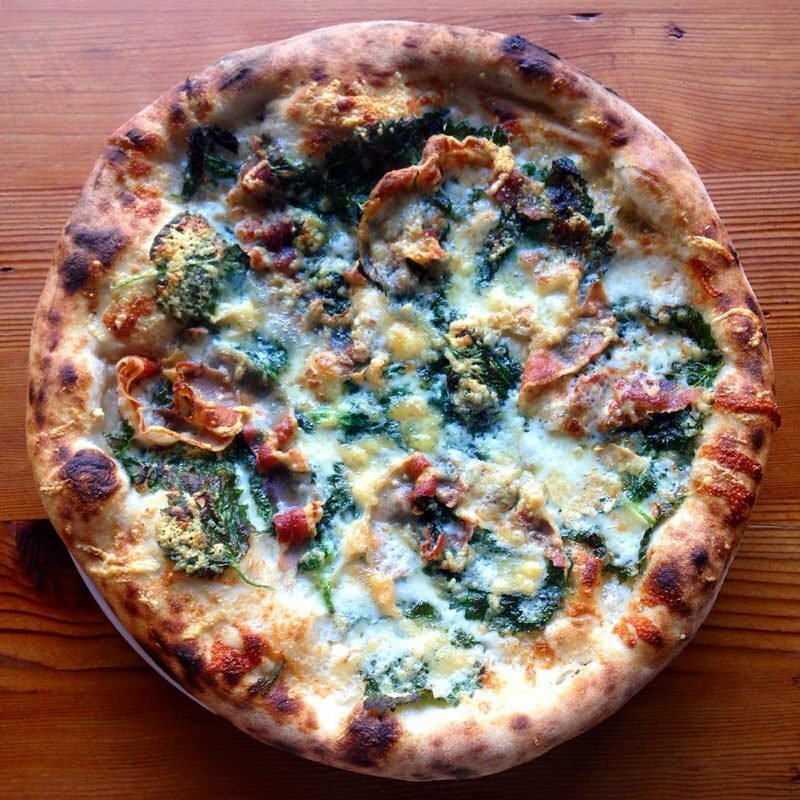 What Restaurant Serves the Best Pizza in Portland? 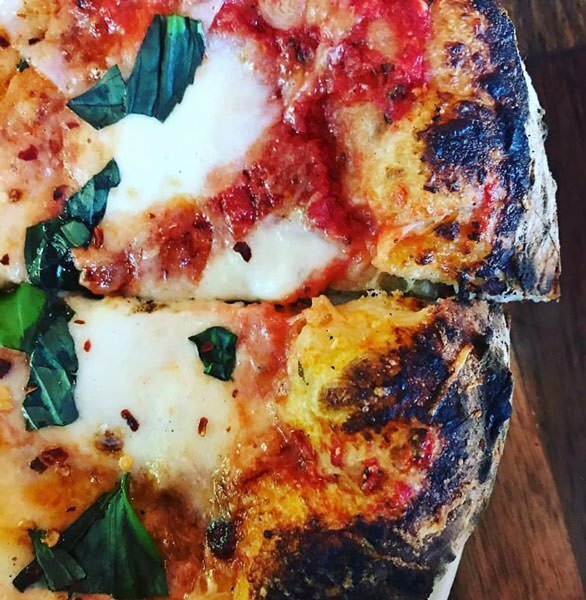 Who makes the best pizza in Portland? I know people who have nearly come to blows over this very question. Every year the same restaurants tend to place in the top five, and 2017 is the same. But not everyone wants a “fancy” pizza, which is probably why Flying Pie ends up on this list. Keep in mind that some of the winners have a strict policy on takeout pies – people dining in get priority, and if they are feeling busy, you will be told to call another day. I know I am going to get letters about “burned pizza”, so I’m going to head them off here. The scorched spots on the edges and bottom of pizza crust is called “char”. Debate has raged for years as to whether this is a good thing. Many aficionados dismiss a pizza which doesn’t have some char, others complain it is burnt. We are firmly of the opinion that it gives it a bit more flavor. 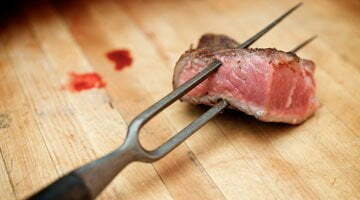 Chefs walk a fine line between a nice char and burnt, and doing it right shows attention to detail. 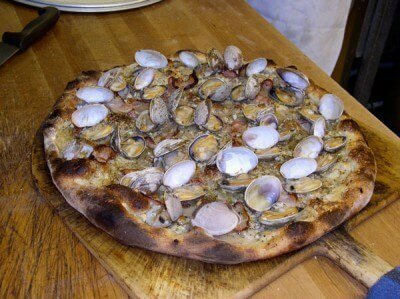 Apizza is well-known for good reason: their pizza is excellent, with good char and a perfect cornicione. For that reason, you’ll frequently find long lines, so get there early. Even better, give them a try for lunch, when they have smaller pizzas available. They added reservations since first opening, and you can reserve a space from one to eight people, but be warned – your entire party must be there before you will be seated. The crust is a thin, Neapolitan style. These folks are purist, and you’ll find the menu options limited because they are more concerned about the quality of what they give you than whether it has 4 different meats. No more than three ingredients per pie, including no more than two meats per pie. If you try to break these rules, you’ll politely be told that this may not be the place for you. The basic pie options are $4 per ingredient for meats and the like, and $3 for veggies, ricotta, tomato sauce, etc. Is their pizza worth the effort? 22% of our readers say decidedly so. 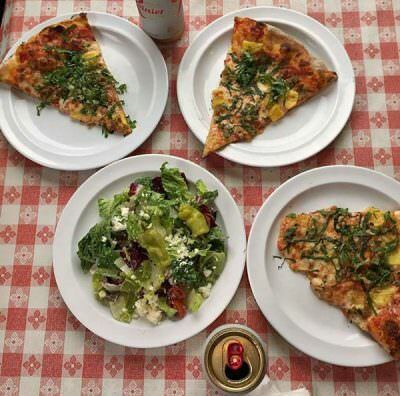 Much has been written in the local press about the wildly successful Ken’s Artisan Pizza – the 700 degree oven, the perfect crust, the paint can lighting, the reclaimed roller-coaster wood for the tables, the little bowls of sea salt — and one wonders if any more can be added. 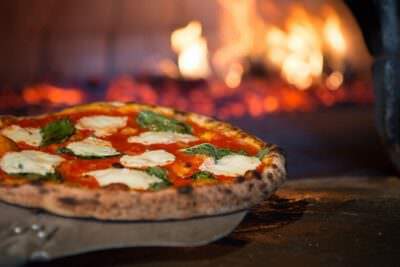 The pizza choices range from basic, such as the Margherita with tomato sauce and, mozzarella and basil; the Margherita with a pile of arugula on top (off-putting to some but very authentic to Italy), to the extra spicy Soppressata made with hot salami, tomato sauce, mozzarella and basil, to the seasonal selection. An autumn option is topped with squash and goat cheese. The other regulars are Anchovy; Arrabbiata with hot Calabrian chiles; the Amatriciana with house cured pancetta, red onion and Parmesan; and the Fennel Sausage and Roasted Onion, with a choice of sweet or with Calabrian chiles. In fact, from the packed house night after night, the lines of people happily waiting, the glowing reviews, Ken Forkish has created a veritable object of desire with his pizzeria. Our review. Interview with Ken. Lovely’s makes a solid pizza which ventures beyond the standard toppings at many restaurants. “Morel mushrooms with flowering thyme, roasted onions and bayley hazen blue, Spinach with favetta and fava beans, basil and fresh sheep’s cheese; Crushed yellow new potatoes with fenugreek greens, shell peas, taleggio, pancetta and egg…” you get the idea. I like to take out-of-town visitors here as it is “so Portland”. As do the majority of restaurants on this list, ingredients are seasonal, local and organic whenever possible. Made with coddled, naturally leavened dough, Lovely’s makes some of the best pizzas in Portland. Add a great staff and a family friendly atmosphere… and don’t forget, they make their own ice cream. Dove Vivi’s crust is prepared by hand using organic cornmeal from Bob’s Red Mill in Portland and sustainably grown Shepherd’s Grain flour. Sausage is made from all natural Carlton Farms pork, located in Carlton, Oregon. Pancetta, Tasso ham, Canadian bacon, maple bacon, and corned beef, and case our andouille, chorizo, bratwurst and chicken sausages are cured on site. Eschewing tradition, Dove Vivi uses a cornmeal crust that is thicker, crunchier and somehow tastes more “buttery” than other pizza styles. All of these factors makes it a change from the norm, and an interesting option on the Portland pizza scene. If you want it vegan, you’ll find a couple of options, the best known being the Corn Cashew, with vegan roasted red pepper and cashew, fresh sweet corn, caramelized onions and chives. Salads aren’t bad either. Pizza Jerk was started by Tommy Habetz of Bunk Sandwiches Fame, and Ben Hufford and Brandon Smyth of Water Avenue Coffee. The restaurant has an awful website, but it highlights their widely varied menu, which has a bit of everything – Korean chicken wings, French fries, frito pie, pasta, Dan Dan noodles, fried rice and more. The real star is the pizza, East coast style, and you’ll find a large menu of options. Though some are pretty traditional, you’ll find selections like Clam Jam with Bacon, a New Han Dynasty with kimchi, bacon, blue cheese, BBQ sauce, onion and basil, or a Sunday Sauce Pie with pepperoni, meatball, sausage and ribs. Yeah… these are a bit out there. If you are an aficionado of thick crust, they have cast iron 12″ pies – cheese, pepperoni or a traditional supreme with sausage, black olives, bell peppers and red onion. While some of the pies may seem a bit out of the box, that is part of the charm – they are willing to try anything. Surprisingly, most are pretty good. At Nostrana, the mozzarella is hand-made and the dough is naturally leavened. With the exception of those with the wettest toppings, the pizzas are crispy all the way through, with just the right balance of toppings and terrific flavors. They are served uncut with a pair of shears, Italian style. I’m lazy so am not a fan, but that’s just me. Try the Diavola with spicy sausage, mozzarella, provolone, San Marzano tomato and Mama Lil’s peppers, the Granchio: dungeness crab, green garlic, scallions, crème fraîche, chives, paprika butter, arugula, or the Salumi with salami, tomato, provolone, mozzarella, oregano, honey and Mama Lil’s peppers. The pies are large and easy to share. 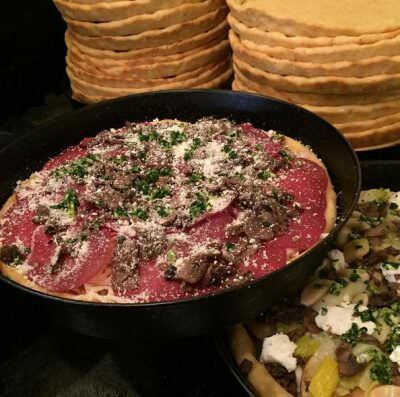 Nostrana is a full restaurant – pizza is just part of a much larger menu. You’ll always find antipasti, charcuterie, pasta, and Italian entrees, as well as terrific desserts. Nostrana is one of the most popular restaurants in Portland, and can have quite a wait on busy nights. Insider’s secret – go for lunch without crowds. Even better, dine on the patio out front for a lovely summer dinner. Our review. Pies start at $12 for a margherita – mozzarella, tomato, basil. Life of Pie is on the East side of N. Williams, just a block down from Tasty n Sons. The restaurant is casual, order at the counter and they’ll bring it to you. Prices are some of the lowest on this list, starting at $10 with toppings $1 each. You’ll find a thin crust pizza with a crunchy crust and reasonable char (though I think they push it a bit far sometimes). You can pick your toppings at Life of Pie, so it’s good for those of you who are micro-managers. Family friendly. 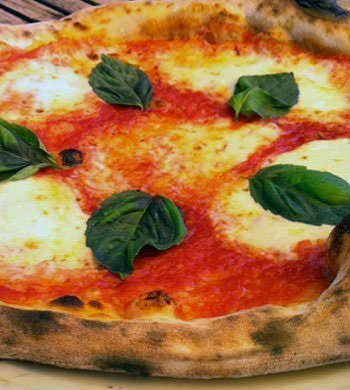 Insider tip, you can get a margherita pizza at happy hour – 11 am – 6 pm for just $5. Flying Pie is the quintessential American version of Pizza, one that most people expect, though a little bit more upscale than Round Table of Pizza hut. The chain opened in 1984, with the owners following a plan of slow expansion ever since. I’ll admit, I’ve never been, so don’t have much more information, other than it is the only large chain to make it to the top 15 on this poll. Category: Best of Portland 2017. Related posts about Apizza Scholls Restaurant, Dove Vivi Pizza, Flying Pie Pizzeria, Ken's Artisan Pizza, Life of Pie Pizza, Lovely's Fifty Fifty Restaurant, Nostrana Restaurant, Pizza Jerk. Apizza Scholls, seriously? Mediocre when I have been there. Scottie’s is hands down the best in the city.